So, you may recall that last fall, we helped spread the word about the Popcorn Factory's contest to find their next new flavor. They reached out to us for help in spreading the word about the contest. 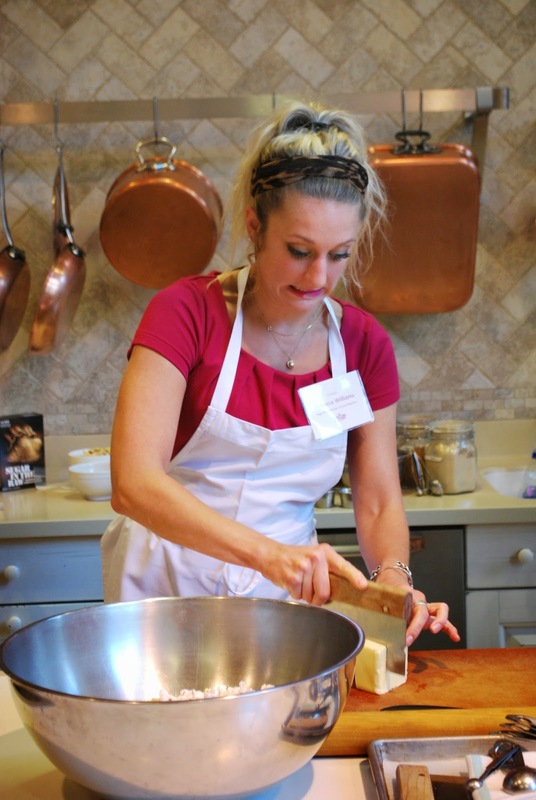 We were thrilled when we were notified that one of the finalists had found out about the contest through our blog and we were invited to attend the Flavor-Off at the Choppping Block when the finalists would make their flavors and they would be judged. There was some tough competition and we were really rooting for our contestant, Rebecca. Each flavor was pretty awesome, but as Marty, the Master Popcornologist and judge said, Rebecca's Sage Brown Butter Crunch "just takes you to a different place." We were so happy when Rebecca was selected as the winner! She was just totally adorable and said that she just came up with the recipe based on what she had on hand. She happened to have some fresh sage on her patio and that's what went in the recipe. The results were delicious! Here's a couple pictures from the Flavor-Off. Rebecca (far left) with additional finalists and Chopping Block staff. That guy in yellow made a fabulous Bananas Foster popcorn that was also pretty awesome! Here's Kelly and Carrie from Chicago Foodie Sisters with Marty from the Popcorn Factory and Rebecca. 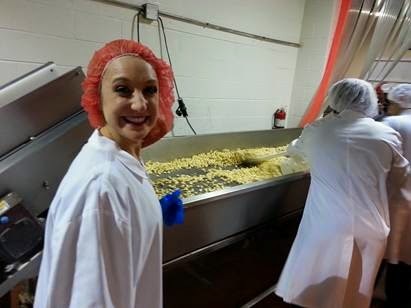 So, fast forward a few months and Rebecca had the privilege of visiting The Popcorn Factory Headquarters where she helped whip up a giant batch of her own flavor, Sage Brown Butter Crunch. Later this year it is expected to be put into production and available for purchase! I'll keep you posted on when that happens. You will definitely want to try it!!!! Congratulations to Rebecca on her awesome recipe and win and we thank her and the Popcorn Factory for the opportunity to be part of this exciting contest! 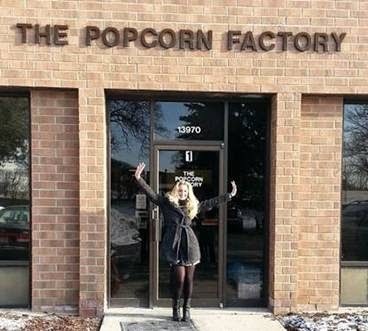 "The visit was extremely fun and a little overwhelming as the people from The Popcorn Factory were just so dedicated and passionate about the company," said Rebecca. "The three men who actually do the labor of cooking the popcorn were so sweet. I have to say it was a very humbling experience to see how much labor goes into actually making mass amounts of popcorn. To say I am honored to have my popcorn professionally made and sold is an understatement. I am honored to have met the people who take such pride in what they do, even though the idea or recipe is not their own. They genuinely care about the thorough skill and meticulous step-by-step process that goes into a batch of popcorn to ensure the product is perfect." 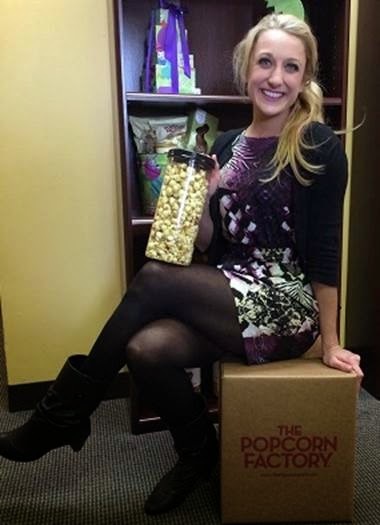 Rebecca and her Sage Brown Butter Crunch Popcorn all packaged up!